Unlike a decade or two ago, today's homeowners have many different home insulation methods to choose from and each comes with their own pros and cons. But one thing they all have in common: they can help you cut your heating and cooling costs if they're used properly. Make no mistake about it; your home's insulation is one of the most important things when it comes to controlling your energy costs. There are many forms of insulation available for use in the modern home, from traditional fiberglass batting and loose-fill cellulose to foam board panels and spray foam polyurethane. Here's a list of what's available and where they're meant to be used. Blanket insulation comes in batts, meaning individual lengths, or one large continuous roll. Available in fiberglass, wool, natural fibers or plastic fibers, this type of insulation is meant for insulating unfinished walls, foundations walls, floors, attics and ceilings. Installation is easy enough for most do-it-yourselfers to handle on their own. Loose fill insulation is comprised of loose material, typically fiberglass, cellulose or wool, which gets blown into enclosed places using a special piece of equipment. Applications include filling in enclosed walls, unfinished attic floors and hard to reach places. Spray foam insulation is sprayed on much like paint. The foam expands upon contact and creates a complete barrier. This type of insulation is best suited for enclosed walls, open wall cavities and unfinished attic floors or anywhere insulation is needed around irregularly-shaped obstructions. Reflective systems are made of foil-faced kraft paper, plastic film, cardboard or polyethylene bubbles. They get fitted between wood frame studs, beams and joists and are designed for use in unfinished walls, ceilings and floors. Foam board is a home insulation method that's designed for insulating unfinished walls, foundation walls, floors and ceilings and unvented low-slope roofs. They can be used either on the inside of the home or outside, although if used outside, they must be covered with weatherproof facing. Inside, the foam board must be covered with ½-inch drywall for fire safety. Structural insulated panels are for new construction only and are used to make walls, ceilings, floors and roofs. Builders simply connect them together to build the home's construct. Using SIPs reduces the amount of time it takes to build the house and provides superior, uniform insulation. Insulating concrete forms are used to make unfinished foundation walls in new construction. Using ICFs, insulation is built right into the home's walls, maximizing thermal resistance. Concrete block insulation incorporates foam beads or liquid foam in concrete to produce blocks that have 10 times the insulating value of regular concrete. 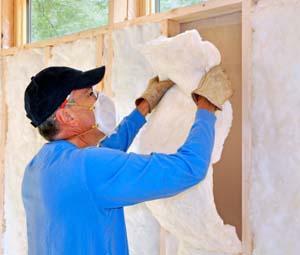 This type of home insulation is used in new construction and in major renovations where concrete is normally called for. When shopping for insulation, homeowners can easily get confused by the R-value listed on the side of the packages. The R-value is the number applied to the insulation's effectiveness for heat flow resistance. The higher the R-value number, the greater the insulating power.